This month features Robin, who has been a huge cheerleader in my spinning journey, particularly over on Instagram. She is enthusiastic about spinning, as obsessed as I am and so very kind. I hope you enjoy reading a bit about her thoughts on spinning and terminology, and learning and growing as a spinner. She is truly an inspiration! Hi there, my name is Robin Wiest. I live in beautiful Bucks County, Pennsylvania for the past 20 years. I have 3 cats, 2 dogs, a 22 year old son, 26 year old daughter and a husband who deserves an award for pretending not to know how much fiber insulates our home. After I learned to knit, I would knit everywhere. I was part of the KIP movement before I even knew what that acronym stood for. I had more than one person comment, “You are always knitting, are you going to learn how to spin your own yarn too?” I’d just laugh and say, “Who has time for that”! Then, I discovered the world of audio podcasts. One particular podcast I listened to was The Knitmore Girls. Jasmine would talk about her spinning in a segment called “Straw Into Gold”, which I would fast forward through (yes, insert gasp here), until one day I actually listened beginning to end. All that spinning terminology sounded completely foreign to me, however, I became intrigued enough to go back and listen to all of the sections I had bypassed. I started to think that maybe spinning would help me understand more about the commercial yarns I was knitting with. 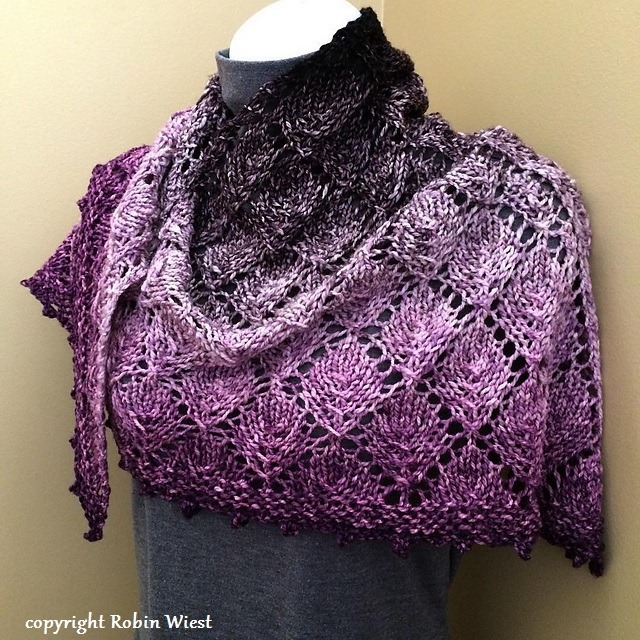 I would grab that gorgeous skein off the shelf, hurry pay for it and cast on my project with enthusiasm, only I was not always achieving the fabric I wanted. I don’t think I really understood that the fiber base and the number of plies in the yarn will greatly affected my end result. So, I started with a drop spindle, 4oz of fiber and my computer by my side. Thank-you YouTube University! 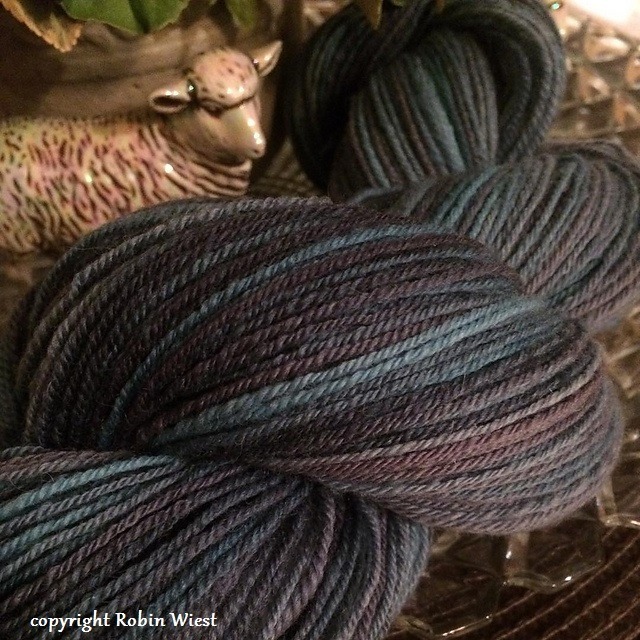 I was immediately smitten with spinning and the yarn I was making, plus, it helped me make better commercial yarn choices for projects which lead to an end result I loved. There’s all this terminology in spinning: woolen, worsted, semi-woolen, semi-worsted. I guess I would have to say my go-to spin would be a short backward draw allowing the twist to come back into the drafting zone a wee bit, which would be considered semi-worsted/semi-woolen depending on the fiber prep. Then either 2-ply or chain ply. 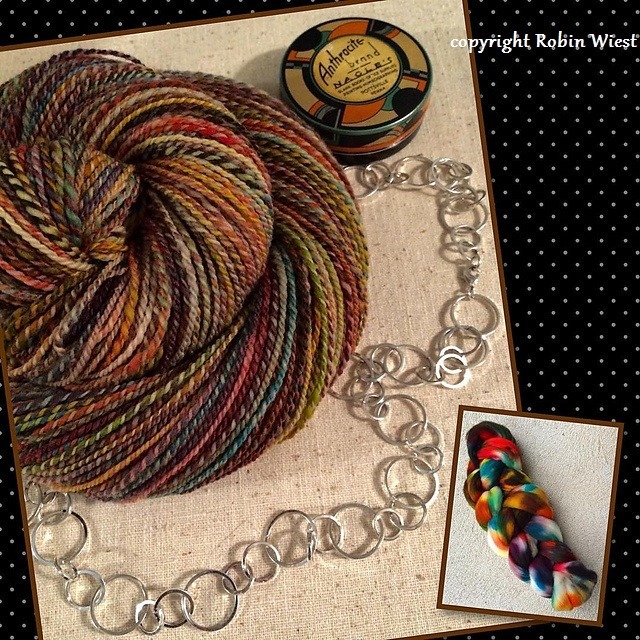 I rarely spin and use just singles in my knitting. 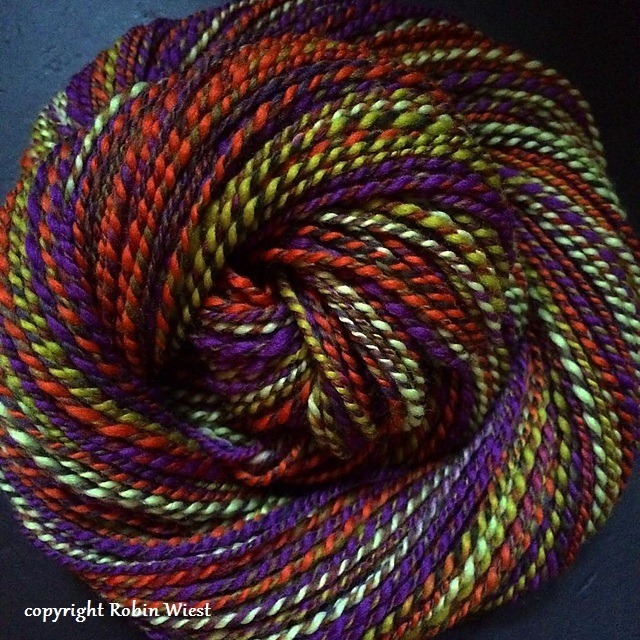 The technique I’d like to work on in 2016 would be corespun and art yarns in general. Despite what I may have thought in the past, they are really not that easy to spin and need a lot of hand manipulation during the spinning. I need to let go and learn not to try to be so controlling with the fiber. This will take some practice. I love my Ashford Joy wheel. The fact that I can fold it up, stick it in its backpack, throw it in the car and away I go is wonderful. But I will never give up my Turkish drop spindles. You just need the spindle and fiber tucked into a bag and your good to go anywhere in a minute. I can spin away till I have that beautiful little turtle and then ply with no other tools need. The final yarn is already a nice neat little center pull ball. My other tool that I depend on is my Schacht Niddy Noddy. It’s adjustable for 1.5 or 2 yard skeins, collapsible making it easy to remove the skein and folds flat for storage and travel. If I have these things and a pair of knitting needles I’m good to go anywhere. When I first started spinning, I’d just go to my spindle or wheel and let the fiber become what it wanted so I could just relax and enjoy the process. Then I’d find a project to fit what the fiber grew up to be. I’d say within the past year I’m trying harder to concentrate on spinning towards a project and plan it out. Watching your podcast segment on how to make a control card and the steps you take to spin towards a specific weight yarn was an immense help. So thank you! This may sound silly but I probably had my wheel for almost a year before I ever moved my drive band to a different ratio. My big ah-ha moment was when I really understood and learned how to use the ratios instead of speeding up/slowing down my feet and hands. My advice to a beginner would be start with only 10-15 minutes of learning how to spin. Then put it aside and walk away. Getting your hands, feet and head wrapped around all the motions can be frustrating making you think you can’t do it. You’re not alone! Yes, there are some that can pick up a spindle and sit behind a wheel and just take off but most of us feel some frustration and angst when learning something new. Remember this is a hobby and the reason you’re trying it is for fun. Ten to fifteen minutes a day and trust me it will eventually click. It’s like patting your head and rubbing your tummy at the same time. If you practice enough there will be that surprise moment and squeal of joy when it clicks. 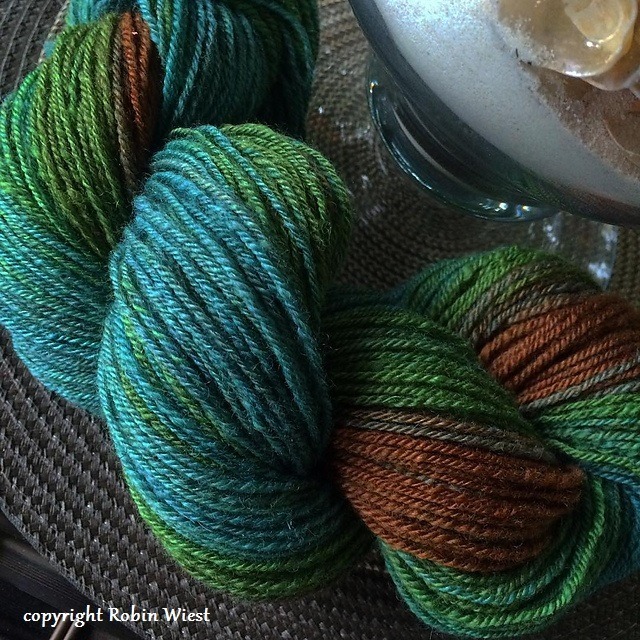 Find Robin on Ravelry as sit-N-spin and Instagram as sitsnspins. 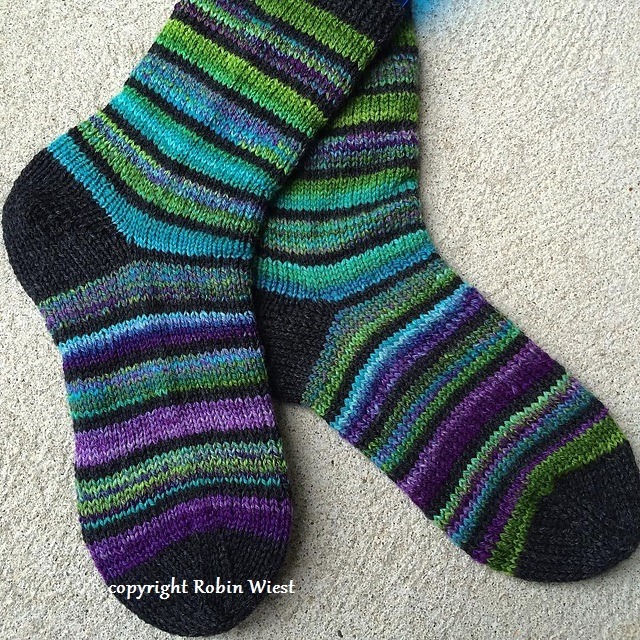 I hope you’ll have a look at her beautiful yarns and projects! Thank you so much to Robin for sharing a little bit of her spinning journey with us. If you aren’t already following her in Instagram, please head over and check out her feed! Previous Post Running out of stash. You will love art yarn techniques…and they can be completed small as well as bulky. I have found that the art yarn has made my traditional spinning improve..it’s all good.